Drum Corps Associates (DCA), the event producer and sanctioning body for the all-age drum corps activity in North America will present its 2012 World Championships in Annapolis, Md. this coming Labor Day Weekend, Aug. 31 to Sept. 2. More than 20 corps in two classes are scheduled to compete over two days at Navy Marine-Corps Memorial Stadium. With expanded coverage in its second year, the DCA Fan Network will not only bring fans the complete performances of all of the corps competing in the Preliminaries on Saturday, but also from the popular Individual & Ensemble and Mini Corps Competition and Alumni Spectacular events. For those who would like access to it all, a $69.95 subscription option will give fans access to all three Championship webcasts in addition to on-demand video of the performances after the events and more. 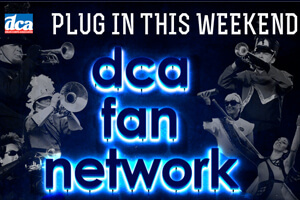 Visit the DCA Fan Network. Learn more about the 2012 DCA World Championships at DCACorps.org.